It's been 18 days, and every day I've been putting a load of laundry in and attempting to fold and put it away, too. (That's the hard part!) But I'm doing pretty well so far. Here's a look at the final product! New habits. I have always been into trying to adopt new habits. I remember when I was in Junior High and really felt like I was gossiping too much, I would spend a month being mindful of trying to form a new habit of speaking kindly. (Didn't always succeed, of course!) Ever since then, I've always tried to be very aware of my shortcomings, if only so I could try to improve on them. This months habit: laundry. 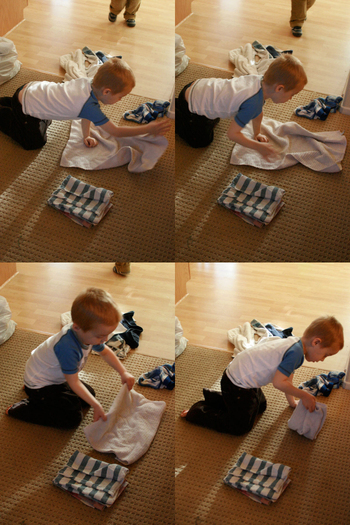 I have moaned about my inability to keep up with laundry for years (four to be exact...hmmm...Jake's four now. Notice a connection?) I have come to the point where there's always a load languishing in the washer and/or dryer, there are usually a few loads on the floor or in one of two laundry baskets around the house, just waiting to be sorted and folded, or if it's already sorted and folded, just waiting to be put away. I don't even bother ironing anymore. I just buy clothes that don't require ironing. Every once in awhile I feel ambitious and buy a top that needs ironing, but is just so cute that I think to myself, "I could iron this, really I could." Then that top lays on the ironing board after its first laundering, just waiting for me to make good on my promise. And there it sits. Until it goes out of style and it heads to the Goodwill box. Poor shirt. Anyway, June is the month of laundry. I always say I wish I had a laundry system I could keep up with, but wishing doesn't seem to get it done. So this month I've decided to purposefully build a new habit, hearkening back to my Junior High habit forming days. This month, I am going to do my laundry every day, and actually fold and put it away every day. (Except Sundays, in order to keep some rest in the rhythm of our week.) I am not only going to start a load a day, I am now going to finish it. And so far, so good. Would you like to join me in my habit forming quest? Maybe next month will be the month that I don't have to moan about my laundry overwhelming me. Wouldn't that be a nice change? I came across this amazing post from the ordinary courage blog about remembering to embrace yourself where you are in your journey. Wow! It is really a revelation for me to think about being ordinary and to be "mindful of the seductive lure of the 'the extraordinary life.'" I've never thought about it that way, but there is a seductive lure that tells us we need to be something more than we are. This is the lure that has me spending so much time thinking about how to start a business or write a book or make a difference to a vast number of people's lives. There is a place for all of those people who do those things, but there's also a place for the ordinary everyday of our lives. Today I: made 48 cupcakes for my grandmother's 95th birthday party. ran around the kitchen and sang the 'Go, Diego, Go!' theme song with the boys. scrubbed a spiderman tattoo off my cheek. cleaned up the backyard. Ordinary things. Wonderful things. Hmmm. What a change in mindset for me. I've been thinking so much lately about food. Okay, so we all think about food. But I've been so mindful of what's in our food (the second ingredient in our poppyseed dressing is high fructose corn syrup!) Even though I always had to read ingredient lists for Greg's chicken allergy and Tyler's nut allergy, I was mostly scanning for chicken and nut products, not noticing the corn syrup, white flour, weird "ose" ending words, and all that. Let me just say that now I am noticing. I actually had to throw our poppyseed dressing away because I just couldn't shake the image of Tyler downing lettuce covered in (basically) corn syrup. Yuck! I'm amazed that I've never really thought before about what goes into our mouths, have you? Of course you have, I'm a little late on the bandwagon. But better late than never, right? We're planning on trying out our local CSA (Community Supported Agriculture: a weekly organic produce basket from local farms) and when I get a chance I'm going to go through our pantry (which needs a good cleaning anyway) and look into what's in our food. Not sure yet if I'll be doing any donating of food for a clean sweep of the pantry. It'll depend on my mood, I guess. All this coming from a girl who had a TV dinner as her last meal. (It was just sitting there in our freezer waiting for me to have a night alone! I promise!) But I'm headed in the right direction, and that counts for something, doesn't it?